Whether you’re putting your house on the market or hoping to enliven the home in which you live, it helps to make small spaces feel bigger. A home that seems cramped is unappealing to buyers and uncomfortable to owners, so expand it! The following strategies, used by designers, can really open up a space, attracting better offers and increasing your level of contentment for all the years you live there. Make a quick inventory and note what pieces of furniture you use, what decór you love, and what stuff has just been sitting in a corner for who knows how long. All homeowners accumulate chairs and other possessions they never use—things that just take up space. If you have an air hockey table collecting dust or a side table against the wall for no reason, sell it! 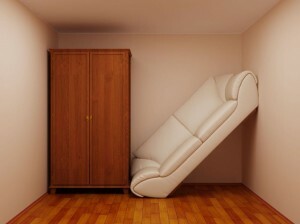 Consolidating your stuff will give you more area to use, without giving up anything you need. Darker colors will make small spaces even smaller, so paint rooms white, or light shades of soft colors. The same is true for area rugs and tapestries: the lighter it is, the bigger it feels. If the room has windows, don’t obstruct them with any furniture, and include mirrors where you can. Even if it’s just a small hanging mirror, the doubled room in the reflection creates the illusion of a larger area. We all need storage in just about every room of our home, but stacks on tables and cluttered bookshelves can make a space feel cramped. An easy solution is multipurpose furniture. Ottomons that hold throw pillows or blankets can enlarge a living room, and a bed-frame with built-in drawers will save the space that an extra dresser would’ve taken up. If you have too many pieces, you’ll have to push them together; but furniture spaced out will make the room feel bigger. A painted ceiling or one covered in hanging plants can feel like a cave about to collapse, but a single chandelier or elegant fixture will draw the eyes upward, expanding the whole perceived height of the room. This will make your home feel more open and comfortable, for you and everyone who ever enters. If you’re interested in purchasing, refinancing, or learning more about mortgage rates, simply fill out our Fast Response form. Our experienced mortgage professionals would love to sit down and discuss your needs. We look forward to hearing from you!